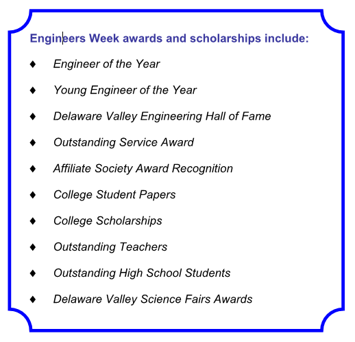 We need your help in supporting the scholarships, awards and programs of Delaware Valley Engineers Week and in making the upcoming Engineers Week a success. Besides monetary donations, we recognize other ways of contributing. We always welcome individuals who are interested in volunteering their time to lead or assist in any of the Engineers Week programs. We also encourage your company’s participation in activities that celebrate and promote the engineering profession, not just during Engineers Week, but throughout the year. The Engineers Week Committee of the Engineers’ Club of Philadelphia sponsors the Delaware Valley Engineers Week programs on behalf of the area’s engineering and technical societies. The events and activities are supported by major corporations and individuals as well as participating societies and universities. All Committee members are volunteers. Every year, there is a supplement in the Philadelphia Business Journal for Engineers' Week. Make sure your company has an advertisement! Reserve your ad by Thursday, January 24! In addition to, or in place of, the Sponsorship Packages, you can select among several recognition opportunities, such as bar sponsor at any of our three events, program sponsor at our Luncheon, and several other options. This sponsorship will be cited in the event program and at Delaware Valley Engineers Week events. These range in cost from $250-$500. You will also have the opportunity to donate a door prize of your choice to be awarded via a raffle at our Luncheon. If you are interested, please email us at contact@engrclub.org for additional details and availability. NOTE: These sponsorships are only available as general DVEW donations.